We all like to complain about the weather – especially in Lancaster County where we can sometimes see drastic swings. But few people realize the significant impact that the weather can have on our economy. We at Horst Excavating know all too well how true this is, since ours is a market that is directly affected by weather of all types. No matter if it is rain or snow, hot temperatures or cold, we need to have an understanding on how these conditions are going to impact our projects even before they occur and adjust our construction methods accordingly. 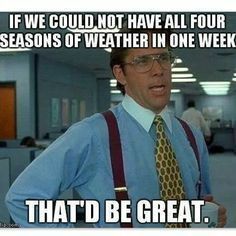 Since most construction projects that require sitework or earth moving have a duration that can last at least a few months, and we live in an area that has all four seasons (sometimes in one week), it would be very unlikely for us to make it through a project without the weather commanding our attention. This year has been one of the wettest on record, with six of the past nine months falling into the above average or much above average category for precipitation. While everyone has noticed, not everyone realizes the economic impact an especially wet year can have. Horst Excavating has had to overcome significant challenges thanks to the 54.2” of precipitation we’ve seen to date (to put that into perspective, that’s an increase of over 40% from where we usually are at this point in the year). 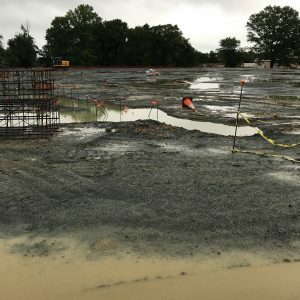 Lost time – both on project schedules and our crews’ hours worked – is probably the biggest factor, with rain effectively shutting down many job sites for entire weeks over the unusually wet summer. Some areas saw flooding repeatedly over a short time period, over saturating the earth and making sitework nearly impossible. Excessive rainfall also has a major effect our equipment, crews and Superintendents. When running in continuously muddy conditions, we frequently need to stop our equipment and shovel out the tracks to clear them, as well as attending to the construction entrances, fixing the silt fences and scraping mud out of the way. This additional time spent ensuring we can keep moving on a site decreases productivity, increases costs, and can slow a job’s progress quickly. While we generally anticipate some wet conditions in the spring, 2018’s weather patterns have proven to be wildly unpredictable and made for a difficult year in the excavation industry. Although we always consider the weather when putting together estimates and planning for a project, sometimes Mother Nature reminds us who is really in charge. To learn more about how Horst Excavating can help you with your project, please contact us.